1. As this chapter opens, we find Master D.K. purposefully limiting the scope of His inquiry. Given that extant historical writings account for, perhaps, no more than ten thousand years of the world historical process, is it no wonder that when faced with millions of years of planetary history, He chooses not to go into detail. 2. Great spiritual events in the relatively recent history of our planet (i.e., during the past twenty-one million years or so) have created the kingdom in nature known as humanity and affected it profoundly. Decisions within Shamballa have determined the state of our present human civilization and culture. Those factors which determine our lives most have originated (apparently) outside ourselves altogether. We human beings are tiny factors in a relative huge system of causes and effects. 3. One day, when we are members of the Spiritual Hierarchy of our planet, we will be able to “read the record” for ourselves, and understand in far greater depth all that “we” and our planet have experienced since the inception of the human kingdom. Many great Beings from planetary and solar sources, and once or twice from cosmic sources, have at times lent Their aid and dwelt briefly upon our planet. By the energy which flowed through Them, and by Their profound wisdom and experience, They stimulated earth's evolutions and brought the purposes of the Planetary Logos so much the nearer to completion. Then They passed on, and Their places were taken by those among the members of the Hierarchy Who were willing to undergo a specific training and expansion of consciousness. In turn these adepts and Masters had Their places filled by initiates, and thus constantly has there been opportun­ity for disciples and highly evolved men and women to pass into the ranks of the Hierarchy, and thus constantly has there been a circulation of new life and blood, and the coming in of those who belong to a particular period or age. 1. Here Master D.K. is speaking of the coming to Earth of not only extra-planetary but of solar avatars. These Beings must, for the moment, remain nameless, but we can suspect that the planet Venus was involved and also the star (or star system of) Sirius. 2. The main principle is easily realized; help is always available and the universe is fundamentally benefi­cent. The universe is designed on the principle of sacrifice, functioning from high to low and low to high. 3. While humanity and the plane have received aid from extra-planetary and even solar sources, it is also true that great servers of humanity and Earth have been derived from within our own planetary scheme (whether from the Moon-chain or evolving from the ranks of our own Earth-humanity). Given our ignorance of ancient planetary history, the majority of these names must also remain unknown to us. 4. Today, when thinking of the world’s great Teachers, we speak in terms of the Buddha and the Christ, but, during long-passed eras, Teachers and Sages as great as They almost certainly have existed. While the names of such Teachers have been lost to posterity, Their beneficent legacy has reached us in the form of improved conditions for and within humanity and upon the planet. 5. When we think of the present members of Shamballa, we find that today, even long ages after the founding of the Hierarchy, there are still those who derive from planetary sources other than our Earth. Through intensive processes of long duration, some of the members of our Hierarchy have undergone what the Tibetan calls “specific training” to fill these Shamballic and higher hierarchical posts. The former Hercules was probably one such, as, at this time, He is said to be a member of Shamballa. 6. As ages pass, there is a constant progression and upward movement. Initiates take the place of upward-moving Masters, and disciples take the place of initiates. The process of “moving up through the ranks” sees opportunity to ‘ascend’ conferred upon all those associated with the hierarchical structure of the planet. 7. In all this constant mutation, the Divine Plan for any particular historical period is well-served by those who know best (as a result of first hand participation in the civilization and culture of the times) the problems of that period. The Divine Plan is characterized by adaptability, and the mode of hierarchical progression serves the process of intelligent adaptation to planetary need. Some of the great names during the later periods are known to history, such as Shri Sankaracharya, Vyasa, [Page 38] Mahommet, Jesus of Nazareth, and Krishna, down to those lesser initiates, Paul of Tarsus, Luther, and certain of the outstanding lights in European history. Always have these men and women been agents for the carrying out of race purpose, for the bringing about of group conditions, and for the furthering of the evolu­tion of humanity. Sometimes they have appeared as beneficent forces, bringing peace and contentment with them. More often have they come as agents of destruction, breaking up the old forms of religion and of government in order that the life within the rapidly crystallising form might be set free and build for itself a newer and a better vehicle. 1. The Tibetan mentions the names of great teachers and servers emerging on differing ray lines. In this list, Vyasa may well be the most ancient, but not according to documentation in the usual encyclopedic sources which places him after Krishna. According to The Secret Doctrine, however, there were many Vyasas (just as there may have been a number of Patanjalis); it appears to be a generic name. The Encyclopedia Britannica shows him flourishing around 1500 BC as the compiler of the Indian Epic, the Mahabharata and organizer of the Vedas. The Vedas are, of course, far more ancient that 1500 BC and many Vyasa may have been involved in “dividing: the Vedas. 2. Both Jesus and Mahommet emerged on the sixth ray. Mahommet (according to the Tibetan, a “very advanced initiate”) was a disciple of the Master Jesus. 3. Krishna flourished some 5000 years ago and was, according to the Tibetan, an earlier incarnation of the Lord Maitreya (the present Christ). 4. Paul of Tarsus (now a fifth ray Chohan) emerged on the fifth and first rays and Luther (a lesser initiate) upon the first and probably sixth. The “lights in European history” may well have included some of the great European philosophers. Pythagoras, Plato and Aristotle (though originating in the relatively “ancient” world) would have to be included, so foundational were they to European thought. Sir Francis Bacon was certainly another. Perhaps we could consider him the Archetypal European and to this day, as the Master R., He holds the post of Regent of Europe (as well of Europe’s extension, America). 5. It is clear that such great individuals do not live unto themselves alone. Their lives can be considered significant events in the evolutionary history of humanity. 6. Regardless of Their ray, They seem to bring something of the Shamballic quality, for They have broken up old, crystallized forms of religion and government so that new and better forms could emerge. 7. It is said of the great second ray Teacher the Christ, “I bring not peace but the sword”. Of course, this must be interpreted occultly as the “Sword of Truth” and the ability to discriminate between the real and the unreal and thus end glamor, but it also indicates the disturbance which a full release of the Christ-force will generate in society. Much that is stated here is already well known, and has already been given out in the different occult books. Yet in the wise and careful enunciation of collected facts, and their correlation with that which may be new to some students, comes an eventual synthetic grasp of the great plan, and a wise uniform realisation as to the work of that great group of liberated souls who, in utter self-abnegation, stand silently behind the world panorama. Through the power of their will, the strength of their meditations, the wisdom of their plans, and the scientific knowledge of energy which is theirs, they direct those force currents, and control those form-building agencies which produce all that is seen and unseen, movable and immovable in the sphere of creation within the three worlds. This, coupled to their vast experience, is what fits them to be the agents for the distribution of the energy of the Planetary Logos. 1. When we encounter information with which we may already be familiar, we may be inclined to pass over it quickly, seeking some new item of information. The Tibetan, however, gives us a hint concern­ing how to create a “synthetic grasp of the great plan”. Much correlative work remains to be done in relation to the many known facts. When this is properly done and combined with some new items of information, a much broader grasp of the truth will emerge. We may know many things, but do we know how they relate to each other and the patterns they create? 2. We should note a new definition of Hierarchy given in this paragraph: “the great group of liberated souls who, in utter self-abnegation, stand silently behind the world panorama”. Particularly noteworthy is the phrase, “utter self-abnegation”. While the members of the Hierarchy may seem to us as illustrious individuals (and indeed they are), Their stature grows out of Their power to sacrifice. They have placed all upon the altar of the Divine Plan and Purpose. 3. Their accomplishments are, from the human perspective, staggering. The Tibetan lists Their accomplishments in relation to will, meditation, wisdom, and science — and, of course, He would have to include love, for the Spiritual Hierarchy is often called the “Hierarchy of Love”, and only love (spiritually understood) will open the door to participation within that august fraternity. 4. The members of the Hierarchy (and Shamballa) are certainly “the power behind the scenes”. We normally live in a world of effects; They, relative to us, are the generators of causes. 5. They are individuals of no small experience. Of His own experience, the Tibetan states: “I am not an old man, as age counts among the teachers, yet I am not young or inexperienced.” He is one of those who has most recently achieved Mastership — 1875. Perhaps since that time other have also achieved. Some of the Masters, however, have a much longer and greater experience. 6. In any case, They know the ways of men by having trodden them. Hierarchy is surely a meritocracy. No Master is arbitrarily or capriciously placed in such a high position. Only proven quality has earned them the right to stand where They do. As has already been stated, at the head of affairs, controlling each unit and directing all evolution, stands the KING, the Lord of the World, Sanat Kumara, the Youth of Endless Summers, and the Fountainhead of the Will, (showing forth as Love) of the Planetary Logos. Co-operating with Him as His advisers are three Personalities [Page 39] called the Pratyeka Buddhas, or the Buddhas of Activity. These four are the embodiment of active intelligent loving will. They are the full flowering of the intelligence, having achieved in an earlier solar system that which man is now striving to perfect. In earlier cycles in this system They began to demonstrate intelligent love, and from the standpoint of the average human being They are perfect love and perfect intelligence, though from the standpoint of that Existence Who embraces even our planetary scheme in His body of manifestation, that love aspect is as yet but in process of developing, and the will is only embryonic. Another solar system will see the will aspect come to fruition, as love will mature in this. 1. Several names are given to describe the KING, Sanat Kumara. He is the archetype of all kingliness on the Earth. Each of these names carries a particular emphasis and could be analyzed with profit. There are many more names which could be collected from the writings of the Tibetan, from The Secret Doctrine and from the Bible — well over a hundred. 2. The word “stands” is important. The KING both “stands” at the Center of Shamballa, and “sits” upon the Sapphire Throne. First and second ray functions are thereby indicated. 3. The Tibetan goes on to describe the “Buddhas of Activity” Who are the Three Exoteric Kumaras, also called Pratyeka Buddhas. These Buddhas are very connected to the intelligence aspect of divinity and to the constellation Libra (the glyph of which is a kind of triangle). 4. We are told that these Buddhas and Sanat Kumara are the “full flowering” of intelligence. Interestingly, the Creative Hierarchy functioning under Libra (known as the Triads) are also called the “triple flowers”. 5. D.K. then deals with the relativity of spiritual/evolutionary development. These great Buddhas (quite perfect from the human perspective) still have much to achieve in terms of love (from the Solar Logoic perspective). Further, Their will, though great compared to our own, is only embryonic compared to that of a Solar Logos. 6. Planetary Logoi are “Dragons of Wisdom” seeking the full development of the love aspect of divinity. Solar Logoi are “Lions of Cosmic Will” seeking the full development of the will aspect. Sanat Kumara and the Three Buddhas are closer to being Dragons of Wisdom than They are to being Lions of Cosmic Will. 7. We are told that They achieved in a “earlier solar system what man is now striving to perfect”. We are not told whether that solar system was the one immediately preceding ours, or still more remote in time. It is most reasonable to conclude that the solar system in which They achieved full intelligence was not the system immediately preceding our present one, for man cannot yet hope to reach the status of a Planetary Logos (and the Buddhas of Activity, in the previous solar system, had already achieved that status). 8. The Tibetan indicates than in the next solar system, They will achieve the full flowering of will. 1. This paragraph is replete with occult mystery. 2. The Four Kumaras (or Sanat Kumara and the Three Buddhas of Activity) are given the names Sanat-Kumara, Sananda, Sanaka, and Sanatana. 4. Their order or their rays are not specifically given but, probably, such information could be inferred from knowledge of Their characteristics as suggested in the ancient Indian writings. 5. The name of the Pratyeka Buddhas — “Buddhas of Activity” — suggests that They are primarily asso­ci­ated with the third aspect of divinity. Libra, the constellation very closely associated with them distributes only the third ray in this world period. 6. If the three Buddhas of Activity (Exoteric Kumaras) are associated with the third aspect of divinity, perhaps the three Esoteric Buddhas are associated with the second aspect — “which as yet [is] not in full demonstration upon our planet”, though emerging. 7. Sanat Kumara, the KING, would then be the channel for the first aspect of divinity, even though He is also connected with the second aspect, being the Great Savior and Teacher as well as disciple of our Solar Logos Who is on the second ray. 8. The seven sacred Planetary Logoi of our solar system are called “seven spirits before the Throne”. The “Throne” is the Throne of our Solar Logos. 9. From one perspective, we may infer that Sanat Kumara and the three Buddhas of Activity transmit the Rays of Attribute — the fourth, fifth, sixth and seventh rays, leaving the transmission of the Rays of Aspect to the three Esoteric Kumaras. If this structure were correct, Sanat Kumara would mostly likely be the transmitter of the fourth ray — very fitting in relation to our fourth scheme, fourth chain and fourth globe, and, indeed, He is sometimes called the “Fourth Kumara”. 10. But this is not the only possible perspective. Sanat Kumara is called the “Lord of Venusian Love”, and is thus closely connected with Venus and its particular ray qualities. 11. Other names connect Him with Saturn (“The Ancient of Days”, for instance), and with its ray qualities. 12. If Sanat Kumara is the KING and main Kumara, He is preeminent among the Kumaras, and thus could be conceived as the representative of the first ray rather than the fourth (even though, in a way, He is the fourth Kumara). Since the monadic ray of our Planetary Logos is the first, this inference is not out of place, for Sanat Kumara is, in a way, a projection or emanation of the Planetary Logos in His monadic aspect. 13. On the other hand, the Great Kumara, is intimately associated with our second ray Solar Logos (Whose soul and personality are both upon the second ray). As well, Sanat Kumara is sometimes referred to as the soul aspect of the Planetary Logos. Since our Planetary Logos has a second ray soul, it would not be out of keeping to think of Sanat Kumara as representing, primarily, the second ray. 14. The answer to these questions (“Which sacred planet does Sanat Kumara represent and which ray does He primarily transmit?”) is not going to appear to us with certainty. We can reason, infer and intuit, but in the last analysis, we cannot yet know the answer, for it is one of the secrets of a certain initiation — presumably not one of the initiations of the threshold (the first or second). 15. While Sanat Kumara’s association with Venus and Saturn are readily evident, other associations are also possible. Indeed, Shamballa is the recipient of all planetary energies within our solar system and of energies coming from all the constellations of the zodiac, as well as other constellational energies of an even greater kind — such as those emanating from the Great Bear, the Pleiades and Sirius. 16. From one perspective we are given to understand that Sanat Kumara is a personality expression of our own Planetary Logos, and thus, in fact, a kind of “physical incarnation” of our own Logos. However, the implica­tion in the paragraph is that He is, additionally, the “physical incarnation” of another Planetary Logos — not the Planetary Logos of the Earth-scheme. Venus remains a very good candidate, espe­cially since Sanat Kumara is said to have come from the Venus globe of the Venus-chain of the Earth-scheme. Time and greater illumination will tell. 17. What is important to realize is that through the Seven Kumaras, the seven ray energies reach the Earth, and, as well, the energies of the seven sacred planets of our solar system. 1. They each embody one of the six types of energy, with the Lord of the World as the synthesiser and the embodier of the perfect seventh type, our planetary type. 2. They are each distinguished by one of the six colours, with the Lord of the World showing forth the full planetary colour, these six being subsidiary. 3. Their work is therefore concerned, not only with force distribution, but with the passing into our scheme from other planetary schemes, of Egos seeking earth experience. 4. Each of Them is in direct communication with one or another of the sacred planets. 5. According to astrological conditions, and according to the turning of the planetary wheel of life, so one or another of these Kumaras will be active. The three Buddhas of Activity change from time to time, and become in turn exoteric or esoteric as the case may be. Only the King persists steadily and watchfully in active physical incarnation. 1. A further hint is here given. The “perfect seventh type, our planetary type” must be either the second or the first ray — the soul ray and monad ray, respectively, of our Planetary Logos. 2. For practical purposes, the emerging ray of our Planetary Logos is the second ray, His soul ray. This ray is also the synthesizing ray of our solar system. Its color is indigo. 3. What relation has the color sapphire to the second ray or any other ray? Sanat Kumara sits upon “His Sapphire Throne”? The qualities of the sapphire should be studied, as well as the reason why some sapphires are called “star sapphires”. Although sapphires come in several colors, the color blue seems most likely in relation to Sanat Kumara. 4. We are reviewing a most esoteric summary, a very useful one. 5. Well might we ask regarding the “full planetary colour”. Exoterically, at least, we live on a blue-green planet. Green is associated with the third ray and blue with the second. Our planet is moving towards the blue of its soul. Is Sanat Kumara helping our planet to achieve this through a wielding of the blue energy (with which He may be preeminently endowed)? 6. We understand that the Seven Kumaras are associated with seven planets — probably sacred planets. May it be that the influence of the three synthesizing planets (Saturn, Neptune and Uranus) are conveyed by the three Esoteric Kumaras? It is a possibility. 7. Because of their planetary link, the Kumaras are instrumental in bringing certain Egos from other planets (D.K. states that these planets are sacred planets) into our planetary system. 8. The fifth point tabulated above is most important, showing the preeminence of the KING in relation to the other six Kumaras. It would appear that to be an esoteric or exoteric Kumara is not the result of evolutionary status, as exoteric Kumaras can become esoteric and esoteric Kumaras, exoteric. 9. A hint is given as to the meaning of the term “esoteric” in relation to the Kumaras. It may be that to be an exoteric Kumara is to be in physical (i.e., etheric) incarnation. To be an esoteric Kumara is not to be in etheric incarnation. 10. Thus Sanat Kumara, though from an esoteric perspective always surrounded by six Kumaras, would be, at any one time, only surrounded by three Kumaras in etheric incarnation (as He is). Always exoterical­ly there would be a triangle with its central point (S.K.). 11. When different rays accompany and express through the various precessional ages for their entire duration (for instance, the sixth ray in relation to the Piscean Age and the seventh ray in relation to the Aquarian Age) it may be that one or other of the Seven Kumaras is emerging into prominence and transmitting His ray to Earth for the duration of that astrological age of approximately 2100 years. 12. Both triangles of Kumaras are in revolution and, apparently, interchangeable. Since Sanat Kumara is the main Kumara, and does not change throughout all these rotations or exchanges, it becomes more likely that the ray He transmits is one of the Rays of Aspect (the first, second or third) with the emphasis probably upon the second or the first — and, in a way, on both). 1. The distribution of karma, or human destiny, as it affects individuals, and through the individuals, the groups. 2. The care and tabulation of the akashic records. They are concerned with the Halls of Records, or with the "keeping of the book," as it is called in the Christian Bible; They are known in the Christian world as the recording angels. 3. The participation in solar councils. They alone have the right during the world cycle to pass beyond the periphery of the planetary scheme, and participate in the councils of the Solar Logos. Thus They are literally planetary mediators, representing our Planetary Logos and all that concerns Him in the greater scheme of which He is but a part. 1. Note that Master D.K. calls even great Beings “Personalities”. A personality (if we look for the literal meaning) is mask through which a still greater Being sounds. In a way, the term “personality” means to “sound through”. Each of the great Shamballic Beings is a Being in His own right; as well, each is a representative of still greater Beings (for instance, the Planetary Logoi of the sacred planets) Who may be thought of as vibrating through Their lower Shamballic counterparts or sounding through Them. 2. In this book and in The Rays and the Initiations, Master D.K. gives us a clearer idea of the personnel within Shamballa. In this paragraph the Four Lords of Karma, or the “Four Maharajas” are mentioned. These great karmic Beings are representatives of four still greater Sirian Lords of Karma. 3. That there are four Lords of Karma is interesting in light of the fact that the human kingdom (with which these Lords are presently so concerned) is the fourth kingdom. 4. This is some of the clearest information given on the nature and function of the Four Maharajas. We can see that They can and do focus upon the microcosm, the individual. They also can represent the entire planet in august Solar Councils. 5. Of B/beings Who presently serve on Earth but Who have access to the Solar Logos and His Council, the Solar Angels and the Four Lords of Karma are the two types mentioned in the Teaching. 6. The number four is a bridging number. The New Group of World Servers (a bridging group between humanity and Hierarchy) is qualified by the fourth ray. The Solar Angels (beings who bridge between the triad and quaternary of man) work with the Fourth Systemic Law — the Law of Magnetic Control. The advanced human being treads the Fourth Path (the Path to Sirius) to become, eventually, a Solar Angel. And the four Lords of Karma, bridge between our planetary Shamballic Council and the Councils of the Solar Logos. 7. The fourth ray (the central ray of the seven) is the ray of the “mediator”. 9. The parallels between the Eastern and Western esotericism are important to note. Bridges can be made between apparently contradictory systems of thought by noting differing terminologies for the same types of beings. In this case, the Four Maharajas are the “recording angels” of Christianity. 10. As these Angels are “Keepers of the Book”, They must be in some manner related to Thoth, to Mercury and the fourth ray. As Mercury is the “go-between”, shuttling between one sphere of influence and another, His association with the Recording Angels/Maharajas is clear. Mercury, as well, is the “scribe”. Their close relation to Mercury is evident. Saturn can be associated with Pain, Mercury with Enlightenment, Venus with Relationship, and which? with Return — Jupiter? (for karma is not only “bad”, but “good” and may bring fulfillment at the end of a cycle). 1. The amount of detail with which the department of karma is concerned is staggering. 2. If however “the mill of the gods grinds slow by exceeding fine”, no karmic detail will be overlooked. 3. In the tabulation presented above we see a hierarchy of karmic spheres of influence, each greater sphere inclusive of lesser spheres. 4. All these types of karma are influential in our individual lives. The influence of group, national, racial and world karma in our individual lives may sometimes be hard to trace, but it is surely effective. Probably the exact working out of each and every one of these types of karma must occur. If one type seems to interfere with the working out of another, it will only temporarily be so. For instance, much individual karma may be interrupted by the onset of wars involving group, national and world karma. The fulfillment of individual karma is not thereby permanently offset — simply deferred. Perhaps, however, much individual karma is expiated in the workings of more inclusive types of karma. 5. We can see that the Department of Karma is closely related to the third aspect of divinity, as is the deva kingdom (so often the conveyers or administrators of karma). Whenever the term “manipulation” is involved, the third aspect of divinity is present. 6. The degree of knowledge necessary to be a successful operative within the Department of Karma must be extensive. To be a Lord of Karma, the knowledge required must be extraordinarily voluminous. We are told of high forms of cosmic mathematics which Lords of Karma must master. 7. Man often thinks much of himself and his mental abilities. We may look at members of the animal kingdom and think how far they have to go before they become as we are. But how far have we to go before we become as a Lord of Karma, or even a Solar Angel (a much lower being, relatively, however great in comparison with us)? 8. Note that the karmic groups here mentioned can only be contracted by initiates of the third degree and beyond. Again the number three appears in relation to this Department of Karma. 9. We can see that, however essentially free all self-conscious beings may be, very little is happening by chance. Behind the apparent chaos is intelligent, lawful regulation. The work of the Manu.
. He is the second Manu that the fourth root-race has had, having taken the place of the earlier Manu at the time of the final stages of Atlantean destruction. He has remained to foster the development of the race type, and to bring about its final disappearance. The periods of office of all the Manus overlap, but there remains no representative of the third root-race upon the globe at this time. Vaivasvata Manu has His dwelling place in the Himalaya mountains, and has gathered around Him at Shigatse some of those immediately connected with Aryan affairs in India, Europe and America, and those who will later be concerned with the coming sixth root-race. The plans are prepared for ages ahead, centres of energy are formed thousands of years before they will be required, and in the wise fore-knowledge of these Divine Men nothing is left to sudden eventuation, but all moves in ordered cycles and under rule and law, though within karmic limitations. 1. Here is presented some extraordinary information on the Manus and Their work. 2. The Manu is the prototype for all men of a given race. Vaivasvata Manu, the Manu of the fifth root-race, sets the type for that race. 3. He is particularly associated with the Aryan race. Is the Aryan race the same as the fifth root-race? Many references affirm this. Yet the fifth root-race is frequently said to have begun some one million years ago, before the final destruction of Atlantis. 4. But in this paragraph, Vaivasvata Manus is said to have presided over the Aryan race since its inception some one hundred thousand years ago. Clearly we have a discrepancy. What was it that began some hundred thousand years ago? Was it a confirmation and stabilization of the fifth root-race type which could at last be called truly Aryan? Was it the Aryan (Teutonic) subrace of the greater fifth root-race? A close study of planetary chronology leads to much frustration because clearly given dates for the same cycles or periods prove (apparently) contradictory. 5. Clearly, a period of one hundred thousand years is significant in relation to the Aryan race, but so is the period of one million years in relation to the fifth root-race, often called the “Aryan Root-race”. 6. The Manu of the fourth root-race, if He has presided since the final stages of Atlantean destruction, has presided for some eight hundred and sixty thousand years. Interestingly, we are told that the fourth root-race type is to disappear. We are not told when. At this period of history, a huge number of human beings on our planet belong to the fourth root-race type (physically considered) — the oriental races. 7. We can see how important the little place called Shigatse (in former Tibet) has been as a focal point for the direction of world affairs. The Master M, K.H. and D.K. are said to have lived in Shigatse (in an outer sense, in actual physical homes). 8. The time scale of the Manu is vast compared to our own. Plans are laid thousands of years ahead. Indeed, His thinking spans centuries, even millennia. We can see in the way His plans are laid, the close cooperation of the first and seventh rays. Nothing is left to surprise, or as the Tibetan states, “to sudden eventuation”. The Divine Plan is too important for a casual approach. 9. To be as these Masters are, our attitude toward time must change. The personality is in a hurry knowing that time (for it) is short. The soul endures and thinks in terms of much greater time periods. It would be good practice for us, as personalities, to do similarly. As for the spirit/monad, it ‘thinks’ in cycles far greater. One monadic cycle is said to be 250,000 years. 1. In this paragraph, the work of the Manu is described in considerable detail, and it is a great work. 2. These ideas may be somewhat familiar to us. Every great statesman is, in some sense, a representative of the Manu. 3. The whole question of race (its founding, direction and dissolution) is in the hands of the Manu. He is a builder and works with the building devas. He is in charge of building habitations for the evolving consciousness — forms or habitation which will promote the development of that consciousness. 4. The second ray is the ray of the builder and Christ is upon the second ray. Yet it is the Manu (presumably under the building influence of Vulcan) Who works with the building of the racial type. 5. Groups have to be segregated out of present races to provide a suitable nucleus for future races. Great movements of immigration and emigration have provided the means by which this has been accomplished. Wars (producing floods of refugees) have also played their part. The destruction of lands through earthquake and flood has been involved as well. We note that to the Manu is committed the task of the “raising and lowering of continents”, presumably for the purposes of promoting the development of more ideas racial types. 6. The Manu is, above all, an occultist. He is involved with preparing the forms through which consciousness must manifest. His work is, in a way, external when compared to that of the Christ (who works more with the consciousness aspect and with the subjective life within the forms). 7. A hint is given that in America and Australia experiments in preparing new racial types are underway. 8. The Tibetan is often at pains to explain that a true race is a “state of consciousness”. The Aryan race (in consciousness) is found among all racial types. It is nevertheless true that refinement of the racial form has proceeded step-by-step with refinement of consciousness. A new race is coming (first the sixth subrace of the present fifth rootrace, and later the actual sixth rootrace, itself). This race will demonstrate a new type of consciousness and, very likely, a new racial type (physically and psychically speaking) will appear concomitantly with the appearance of a new type of consciousness. The energy which flows through Him emanates from the head centre of the Planetary Logos, passing to Him through the brain of Sanat Kumara, Who focalises all the planetary energy within Himself. He works by the means of a dynamic meditation, conducted within the head centre, and produces His results through His perfect realisation of that which has to be accomplished, through a power to visualise that which must be done to bring about accomplishment, and through a capacity to transmit creative and destructive energy to those who are His assistants. And all this is brought about through the power of the enunciated sound. 1. The Manus’ methods of occult work are here mentioned. 2. The energy he uses flows from the head center of our Planetary Logos. Before reaching the Manu, this energy passes through “brain” of Sanat Kumara. What is the “brain” of Sanat Kumara, and why is it mentioned? 3. At one point in the book Esoteric Astrology, Saturn is given rulership over the brain and Mercury over the mind. (EA 299) The relation between Sanat Kumara and Saturn has earlier been suggested. 4. In general, the brain is certainly a kind of ‘condensation’ of the mind, just as Sanat Kumara is, from one perspective, a precipitated extension of our Planetary Logos. 5. The first ray deals with densification and crystallization. The line of energy transmission here presented emphasizes the concretion of energy. 6. We see that these great Beings (the Manu, the Bodhisattva and the Mahachohan) create Their powerful effects largely through meditation. 7. The meditation of the Manu is dynamic, as would be fitting for one upon the first ray. 8. Apparently, the Manu is possessed of great powers of visualization. Interestingly, we are told elsewhere that if we wish to apprehend the nature of Shamballa, we should practice the art of visualization. 9. The crystal owes its formation very much to energies upon the first and seventh rays. There is something exact and crystalline about the visualizations/meditations of the Manu. Further, these visualizations/meditations are meant to create great effects in relation to the mineral kingdom. We can understand that in His consideration, the highest and the lowest are related — the head center and the base of the spine (much associated with the mineral kingdom). 10. The Manu works with both creative and destructive energy. He can transmit powers to either create or destroy. The throat center must also be strongly involved in His work, as He works through the “power of the enunciated sound”. Sound is associated with both the first ray and the third. There must be certain potent mantrams employed in the Department of the Manu to help bring about great changes in the racial and planetary form. 11. Work with the heart center is not mentioned, though that center must necessarily be activated as well. Great political workers work with the head and heart centers and the center at the base of the spine. (DINA I 41) This type of chakric activation may be reflective of the Manu’s chakric activation. Yet, the throat center must necessarily be included, just as it is in the lives of great statesmen and politicians. Can one conceive of a Winston Churchill without a powerfully activated throat center? It is the role of the political leader to enunciate the ideal for those he leads. This necessarily involves the throat center. The work of the World Teacher, the Christ. Group two has the World Teacher for its presiding Head. He is that Great Being Whom the Christian calls the Christ; He is known also in the Orient as the Bodhisattva, and as the Lord Maitreya, and is the One looked for by the devout Mohammedan, under the name of the Iman Madhi. He it is Who has presided over the destinies of life since about 600 B.C. and He it is Who has come out among men before, and Who is again looked for. He is the great Lord of Love and of Compassion, just as his predecessor, the Buddha, was the Lord of Wisdom. [Page 44] Through Him flows the energy of the second aspect, reaching Him direct from the heart centre of the Planetary Logos via the heart of Sanat Kumara. He works by means of a meditation centred within the heart. He is the World Teacher, the Master of the Masters, and the Instructor of the Angels, and to Him is committed the guidance of the spiritual destinies of men, and the development of the realisation within each human being that he is a child of God and a son of the Most High. 1. In this paragraph the Tibetan describes the relative universality of the Christ — the Great Teacher Who belongs to no one religion or culture. One of the significant contributions of the Tibetan’s Teaching is the way in which He has convincingly pried the Christ loose from the grip of Christianity. 2. Today the world is troubled by renewed conflicts between Moslems and Christians. If it could be realized that Mahommet was a high disciple (really, a “very advanced initiate” (R&I 254) in the service of the Master Jesus, and that the Islamic religion, in anticipating the coming of the Iman Madhi, is anticipating the Reappearance of the Christ, the necessary bridge to harmony would be made. 3. We are told that the Christ has “presided over the destinies of life since about 600 BC”. Presumably, this means human life, and indicates that at that time (coinciding with the departure of the Buddha to other, more subtle levels of work) the Christ became Head of the Spiritual Hierarchy of the Planet. This means that when He appeared in Palestine overshadowing and taking divine possession of the Master Jesus, He was already Head of the Hierarchy. Prior to 600BC (approximately), the role of World Teacher was fulfilled by the Buddha. 4. The Tibetan points to the Christ’s important emergences among men as Krishna, Christ-through-Jesus, and the ‘Appearance to Come’ during the Aquarian Age. One other appearance (unrecognized by us) is also mentioned elsewhere. 5. It is a familiar idea that the Christ is the “Lord of Love” while the Buddha is the “Lord of Wisdom”. These titles indicate only emphasized qualities, for there can be no doubt that both great Teachers are possessed of Love, Wisdom and Compassion. 6. As a duality of ‘Geminian Brothers’ They represent on Earth and in a way assimilable to man, the Love-Wisdom nature of the Solar Logos. 7. The Christ is connected to Sanat Kumara’s “heart” just as the Manu is to His “head” (or, more specifically, “brain”). Energy from that heart reaches Him from the heart center of the Planetary Logos. 8. The Christ’s meditation on behalf of humanity and the planet is conducted in the heart center. Those who follow the Way of the Christ must also learn to meditate within the heart center. The Christ’s meditation must be characterized by a profound degree of inclusiveness. 9. Some of the Christ’s significant names or roles are given. As the “World Teacher” He has all human beings under His guidance. As the Master of all Masters, every Master of the Wisdom is, somehow, His pupil — this, regardless of Their other various illustrious accomplishments. As the “Instructor of the Angels”, the Christ obviously has something of great value to impart to the deva kingdom. Presumably, under His guidance, the cooperation and merging between the human and deva evolution will proceed with greater harmony and success than otherwise. 10. The Christ guides the “spiritual destinies” of men, which means He has under His supervision the care of their “subjective life”. The Manu deals more with external matters of form, though from a larger perspective, both tasks are “spiritual” as they serve the Divine Plan and Purpose. 11. The Christ is to teach us that we are each a “child of God and Son of the Most High”. In this way, He (under Venus) promotes the realization of the brotherhood of all human beings (for as monads, they are brothers). This teaching relates each human being to the Planetary Logos and to Sanat Kumara. It is teaching founda­tional to the establishment of peace within the human kingdom — for peace is of Shamballa. We can see that this teaching of the Christ is instrumental in overcoming the “great heresy of separativeness”. Just as the Manu is occupied with the providing of the type and forms through which consciousness can evolve and gather experience, thus making existence in its deepest sense possible, so the World Teacher directs that indwelling consciousness in its life or spirit aspect, seeking to energise it within the form so that, in due course of time, that form can be discarded and the liberated spirit return whence it came. Ever since He left the earth, as related with approximate accuracy in the Bible story (though with much error in detail) has He stayed with the sons of men; never has He really gone, but only in appearance, and in a physical body He can be found by those who know the way, dwelling in the Himalayas, and working in close co-operation with His two great Brothers, the Manu and the Mahachohan. Daily He pours out His blessing on the world, and daily He stands under the great pine in His garden at the sunset hour with hands uplifted in blessing over all those who truly and earnestly seek to aspire. To Him all seekers are known, and, though they may remain unaware of Him, the light which He pours forth stimulates their desire, fosters the spark of struggling life and spurs on the aspirant until the momentous day dawns when they stand face to face with the One Who by being "lifted up" (occultly understood) is drawing all men unto Himself as the Initiator of the sacred mysteries. 1. The Tibetan contrasts the relatively objective work of the Manu and His Department with the more subjective work of the Christ and His. 2. The Manu creates the possibility for spirit to enter matter properly (as far as the human kingdom is concerned). The Christ sees to the development of spirit/soul within matter and to its eventual liberation once the necessary lessons have been learnt). Thus it is that the Christ deals predominantly with the life/consciousness aspect within man, rather than the aspect of form. 3. We are in line with the Christ’s orientation when we realize that no matter what may be happening to the form, all is well if there occurs a sufficient ‘harvest in consciousness’. 4. One reads that the story of Christ’s apparent departure from earth is related in the Bible with only approxi­mate accuracy. One can infer that this approximation applies to all manner of detail concerning the actual events of the Christ’s three-year mission. Probably much of that which the “faithful” have believed over the centuries is relatively erroneous or, at least, incorrect in the matter of detail. Thus have glamor and illusion gripped human thought preventing a really true understanding of the work of the Christ, though enough is known to have brought the main themes forward. 5. The Tibetan becomes very literal here. He tells us that the Christ dwells in the Himalayas, has a physical body and can be found in that physical body by those who know that way, that He has a “great pine tree” in His garden, and that daily at the sunset hour and under His pine, He raises His hands in blessing over humanity. 6. Many parts of the Tibetan’s Teaching are both abstract and abstruse. Here He is amazingly literal, probably with the intent of reinforcing the thought of the physical reality of the Christ and His work. The Great Work is benefited if humanity realizes the tangible reality of the Masters of the Wisdom. The majority of human beings do not live in worlds of abstraction; for them reality is tangibility, and the Masters seek to reinforce an understanding of this more tangible level of reality as well as of aspects which are more abstruse and intangible. 7. Speaking of the inclusiveness of the Christ’s individual consciousness, Master D.K. makes an amazing statement regarding the Christ: He say, “to Him all seekers are known”. There are millions of seekers, and yet it is improbable that the Tibetan is exaggerating. What difference would it made to the aspiring soul if he/she knew with certainty that he/she was literally known to the Christ? There would be, I think, an amazing comfort in this thought as well as a great challenge and incentive towards progress. 8. One day each true seeker will stand “face to fact” with the Christ — the Initiator at the first two initiations. Perhaps, then, it will be realized that, all along and all through, the Christ has known the new initiate and helped from a distance with great effectiveness. 9. Truly, the relationship of the Christ with all true aspirants and disciples is spiritually intimate and literally ‘heart-warming’. The Christ sets the example for every teacher and guide on this planet. While His method is too onerous (for most) to be followed with exactitude, the attempt to do so (i.e., to imitate the Christ), will lead to the establishment within the teacher of the “mind that is in Christ” and the heart as well. 10. When these facts are realized deep in the heart, they can overwhelm with beauty. Then does the healing energy of gratitude flow in abundance. The work of the Lord of Civilisation, the Mahachohan. Group three has as its Head the Mahachohan. His rule over the group persists for a longer period than that of His two Brothers, and He may hold office for the term of several root-races. He is the sumtotal of the intelligence aspect. The present Mahachohan is not the original one Who held the office at the founding of the Hierarchy in Lemurian days — it was then held by one of the Kumaras, or Lords of the Flame, Who came into incarnation with Sanat Kumara — but He took hold of His position during the second sub-race of the Atlantean root-race. He had achieved adeptship on the moon-chain, and it was through His instrumentality that a large number of the present more advanced human beings came into incarnation in the middle of the Atlantean root-race. Karmic affiliation with Him was one of the predisposing causes, thus making this eventuality possible. 1. It is amazing to think of the term of the Mahachohan’s office — perhaps several rootraces are included. This can mean millions of years. Therefore, it is extraordinary to think that this planet has just experienced a change of Mahachohan, with the Master R. assuming that post, probably in or around 1925. 2. From what is here said, it appears that He Who is called the “present Mahachohan” (remembering that this book was written before 1925), took His position during the second sub-race of the Atlantean root-race. If “early Atlantean times” occurred some twelve million years ago (EH 226) then, it would appear, this most recent Mahachohan has held His post for perhaps ten million years. The time scale is staggering to the ordinary human estimation. We can presume that the most recent Mahachohan achieved at least the fourth degree on the Moon-chain. Adeptship usually means the fifth degree — at least in our present chain, but at that ancient time, perhaps the fourth degree was the limiting initiation and indication of the adept. 4. In any case, the immediately previous Mahachohan was an individual of vast accomplishment compared with the development of modern humanity. 5. To think of this suggests something of the scope of accomplishment of the Master R. (probably not yet as great as that of his predecessor, who was experienced as a Mahachohan for approximately ten million years), but still, necessarily, considerable. 6. An important principle of migration and transference is given in this paragraph. There is no doubt that Mahachohan had a third ray monad, for He was the very embodiment of intelligence. As well, the majority of human beings on the Moon-chain (at least the majority of those who made their way to the Earth-chain) also had third ray monads (c.f. EP II 201). It was their affiliation with this great soul that made the transference possible. Answering to his call they emerged out of pralaya and entered the Earth-chain in the middle of the Atlantean period. We also remember that their incoming was necessitated by the transfer of certain members of the Hierarchy to other places within the solar system. 7. The coming in of these members of Moon-chain humanity certainly introduced an element of ‘intelligent selfishness’ which could not previously have been present on Earth to the same extent. 8. As the majority of modern disciples were individualized on the Moon-chain, and as the majority of transferees from the Moon-chain were third ray monads, it is very possible that a majority of those who will read the “Blue Books” have some significant relation to the immediately previous Mahachohan”. 9. One can see that we must live in momentous times if a change in Mahachohan occurred less than one hundred years ago. Such changes cannot occur arbitrarily, and must be related to great cycles of which we know practically nothing. Even the greatest cycles of, say, 250,000 years (one revolution around the Pleiades) are of short duration compared to a ten million year tenure in office. His work concerns itself with the fostering and strengthening of that relation between spirit and matter, life and form, the self and the not-self, which results in what we call civilisation. He manipulates the forces of nature, and is largely the emanating source of electrical energy as we know it. Being the reflection of the third, or creative aspect, energy from the Planetary Logos flows to Him from the throat centre, and He it is Who in many ways makes the work of His Brothers possible. Their plans and desires are submitted to Him, and through Him pass the instructions to a large number of the deva agents. 1. We come to understand that the life/consciousness aspect is in the care of the Bodhisattva (now, the Christ); that the matter/form aspect is in the charge of the Manu. The Mahachohan is a relating agent between the two — i.e., between spirit and matter. Intelligence is the mediator. 2. The Mahachohan is, above all, the “Great Executive” Who intelligently materializes the plans of His great Brothers, the Christ and the Manu. Of course, these Brothers have, in Their own right, the ability to material­ize patterns of energy/force in line with the Divine Plan, but the Mahachohan’s skill in this regard is immense and He commands a formidable host of materializing agents — workers in the deva kingdom and the entire “Army of the Voice”. This “Army” responds to the words/mantrams of the Mahachohan’s throat center. 3. When we consider these three Brothers, we see a trinity of the first, second and third aspects functioning through Their head, heart and throat centers, which are reflective of the head, heart and throat centers of the Planetary Logos. 4. We understand that the precipitation or materializing the Divine Plan is significantly in the Mahachohan’s care. This is done with supreme intelligence and an understanding of multitudinous contingencies of a planetary and extra-planetary nature. If we think that the average business executive has much to take into consideration, we can only wonder at the considerations necessary for such a hierarchical Executive as the Mahachohan. Thus you have Will, Love, and Intelligence represented in these three great Lords; you have the self, the not-self, and the relation between synthesised in the unity of manifestation; you have racial government, religion and civilisation forming a coherent whole, and you have physical manifestation, the love or desire aspect, and the mind [Page 46] of the Planetary Logos working out into objectivity. The closest co-operation and unity exists between these three Personalities, and every move and plan and event exists in Their united foreknowledge. They are in daily touch with the Lord of the World at Shamballa, and the entire guidance of affairs rests in Their hands, and in those of the Manu of the fourth root-race. The World Teacher holds office in connection with both the fourth and fifth root-races. 1. It is clear that these “Three Great Lords” are instruments of the Planetary Logos and Sanat Kumara. Through Their agency, this Logos (through Sanat Kumara) is able to work out His plans in the lower three worlds. 2. Although each of Them is principally concerned with a different aspect of divinity, all of Them are related to the third divine aspect, as all of Them are attempting to bring the Divine Plan into objectivity, seeing it manifest upon “Earth”. 3. The Tibetan presents a picture of highly coordinated action between these three and their “daily” consultation with the Lord of the World. The level of responsibility involved is tremendous and unremitting. 4. Those of us who are attempting to work in group formation, perhaps in some executive function, have the archetype presented to us through the example of these Three Great Lords. 5. Because the work is proceeding upon this second ray planet and in this second ray solar system, the work of the Christ is preeminent, and His two Brothers take Their lead from Him. Essentially, however, within any trinity, no one aspect is of greater importance than the other two. The three aspects are meant to work in perfect, harmonious accord. 6. We are told that World Teacher holds office in connection with both the fourth and fifth root-races, but this does not tell us anything about the duration of His term of office, really much shorter than that of His Brothers. The present members of both the fourth and fifth rootraces are in the care of the Christ, but He began His term of office only very recently, late into the fifth rootrace. 7. It becomes clear that we are in a transitional historical period. 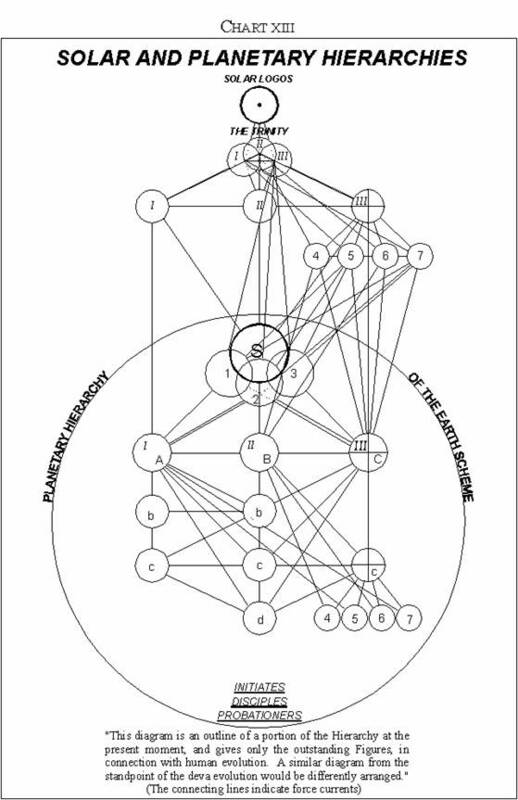 There is an overlap occurring between the fourth and fifth rootraces. So many members of the human race possess fourth rootrace bodies, even though their consciousness is rapidly being elevated into what can be called Aryan consciousness — i.e., a consciousness characterized by mental polarization. 8. The Christ, Himself, is the product of much training within the fourth rootrace, and His students are largely those who have been similarly trained. The new Christ of future years, the Master Koot-Hoomi, will have to address Himself more to the meaning of the number “five” in relation to the spiritual training offered to aspirants, disciples and initiates. 9. It is not surprising to see the Mahachohan’s Department divided into five divisions. Five is the number of the Brahmic aspect of divinity, the third aspect. Five is also the number of the previous solar system and had to be important as well on the Moon-chain, so focussed on intelligence. 10. The Masters on the fourth, fifth, sixth and seventh rays (the Rays of Attribute) are supervised by the Maha­chohan, but according to numerical resonance, may also have significant relations with the Bodhisattva and Manu and Their Departments. The diagrams appended make this clear. III The Holy Spirit Active Intelligence. S. Sanat Kumara, the Lord of the World. The reflections of the 3 major and 4 minor Rays. I. The Will Aspect II. The Love-Wisdom Aspect III. Intelligence Aspect. A. The Manu. B. The Bodhisattva C. The Mahachohan. c. Master M –. c. Master K.H. c. The Venetian Master. d. Master D.K. 4. The Master Serapis. People on the Probationary Path. Average humanity of all degrees. 1. Various relations and cross-connections are here indicated. This book was written when the Master R. was not yet the Mahachohan. At that time He worked under the Manu, as did the Master Jupiter upon the first ray. 2. Now that the Master R. has assumed the mantle of the Mahachohan, He probably does not work “under” the Manu in the same way, but, nevertheless, in the closest affiliation. 3. Master Jupiter is “Regent of India” and Master R., “Regent of Europe and America”. In a way they are kings or rulers, but they guide by the power of thought, meditation and the manipulation of energy currents. For all the potent guidance which They give, They do not infringe the free-will of those they guide. 4. The role of the regent is to “impress and inspire” through the directing of mental currents. The power of Their focussed thought is so great that, at length, the nation or civilization over which They rule will perform that which They intend. This is not a certainty, as it is said that even the Christ does not know what humanity will do. But it is a great probability. 5. The Master R. is upon the seventh ray (in His soul), but as a monad, is to be found upon the third ray — essentially. The seventh ray is directly reflective of both the first and the third rays. It is, in a way, a lower, more concrete aspect of the first ray, hence the Master R.’s relation to the Manu. 6. Yet in relation to intelligence, the seventh and third rays have much in common, and initiates upon these two rays are usually distinguished by keen, practical intelligence. The World Teacher presides over the destiny of the great religions through the medium of a group of Masters and initiates Who direct the activities of these different schools of thought. In illustration: — The Master Jesus, the inspirer and director of the Christian Churches everywhere, [Page 47] though an adept on the sixth ray under the department of the Mahachohan, works at present under the Christ for the welfare of Christianity; other Masters hold similar posts in relation to the great oriental faiths, and the various occidental schools of thought. 1. The focus in this paragraph is on the work of the World Teacher the Christ, and on the Masters, Who though perhaps related to the Mahachohan because they express through Rays of Attribute, are, nevertheless, functioning presently in the service of the Christ. 2. The Christ presides over the welfare of the “great religions”, considering them as “different schools of thought”. 3. It is said of the Master Jesus’ relation to the Christian Church, that He is its “inspirer and director”. These functions would fit well with what are probably Jesus’ two major rays — the sixth and the first. He is surely a sixth ray soul. May He not also be a first ray monad with a sixth monadic subray? 4. Is it not interesting that the Master Jesus seems to be more specifically affiliated with Christianity than does the Christ? 5. Who may be the Masters holding similar to that of the Master Jesus, though in relation to the “great oriental faiths”, it is not presently possible to say. Is Paramahansa Yogananda one? Oriental religions are not all philosophical, and the masses of people in the East as well as the West have to be led through faith, as they are emotionally polarized. When one thinks of the “Krishna Consciousness Movement”, focussing on the great Teacher, Krishna, an earlier incarnation of the Christ, one can see how very devotional is the approach — as devotional as the usual approach to Christianity. 1. The ray of harmony or beauty. 2. The ray of concrete science or knowledge. 3. The ray of devotion or abstract idealism. III. Active intelligence, or adaptability. The four rays or attributes of mind, with the third ray of intelligence, as synthesised by the Mahachohan, make up the sumtotal of the fifth principle of mind or manas. 1. The Mahachohan’s department is the largest, having the greatest number of Master and subsidiary workers, representing the greatest number of rays — five. 2. The great detail of manifestation falls into His hands. The scope of His intelligence is necessarily tremen­dously diversified. Just a little study of the life of Francis Bacon, or accounts of the life of the Comte de St. Germain, will reveal an extraordinary, diversified intelligence in action. The Count spoke many languages, ancient and modern, and was current with the newest developments in all fields under the fourth, fifth, sixth and seventh rays — synthesizing them as a Master Magician upon the third ray. The third ray is the “Ray of the Magician”; the seventh ray is the “Ray of the Ritualist”.